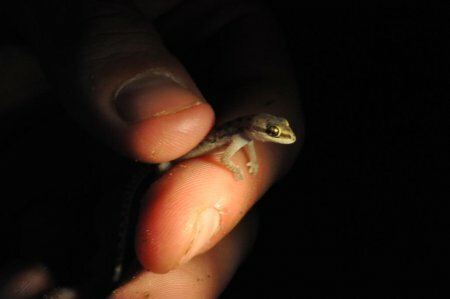 A student holds a Gecko during a nightwalk led by Dino Martins. 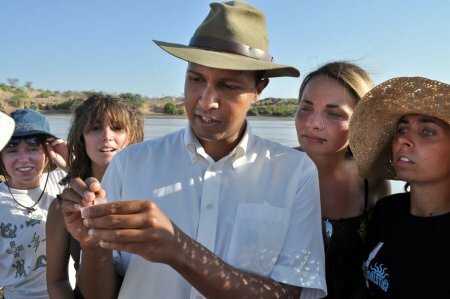 TBI’s Ecology course kept Field School students busy from sunrise until sunset and beyond, as Dino Martins led students on birdwalks, collecting expeditions and late night hunts for scorpions. The landscape around TBI is filled with a fascinating array of East African birds, amphibians, and insects, all of whom took advantage of the rains earlier in the week to feed, and sometimes breed. Turkana roosters begin to crow a few hours before the sun rises each morning, and are shortly joined by a wild chorus of other species found throughout the Turkana Basin and Rift Valley. Ring necked doves coo with light trills, francolins rustle through the undergrowth, and “Go-Away” birds call “Bwaa, bwaa:” thought by some to sound dismissive, though “bwa” is the command for “come” in Turkana. 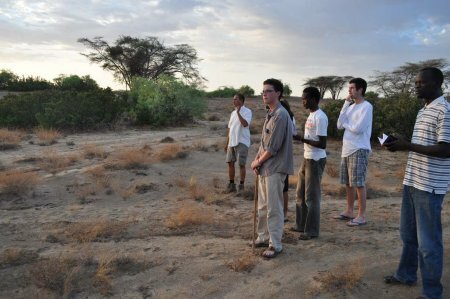 After leading students into the bush for an early morning birdwalk, Dino took them down to the Turkwel River, at mid-day, to observe and sample the fauna after the fall of rains. 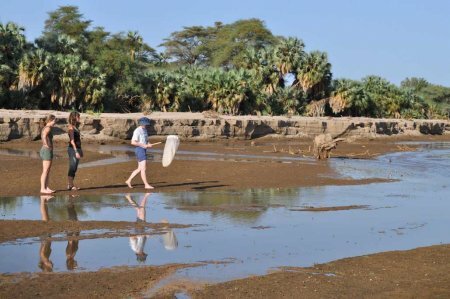 The mud and waters were teeming with life, and students preserved many specimens for subsequent study at TBI and other institutions throughout Kenya. Following evening lectures, students headed back into the field to collect data for their own research projects. Some TBI students have been examining the insect biodiversity associated with riverine or desert steppe shrubs. 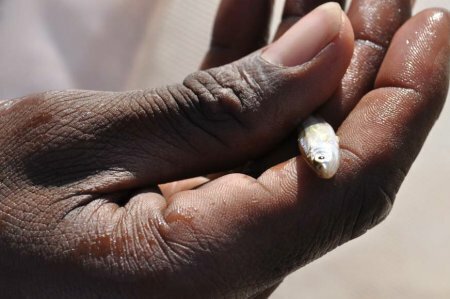 Others have been investigating the use and management of water resources among Turkana living adjacent to the Turkwel River, interviewing local people and staff at TBI. At the end of day, students headed back into the field to conduct a night walk, looking for scorpions, which they then found. 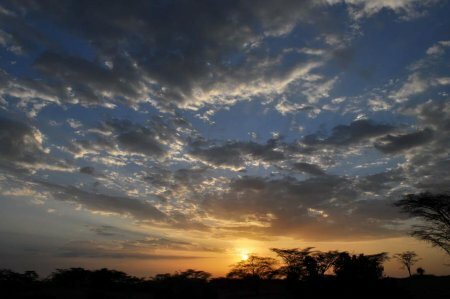 Sunrise over Tukana’s Acacia woodland. Dino and Ben, Luke, Patrick and David watch for birds in the TBI compound. Students were able to observe a great number of birds on these and on other bird walks. Larger birds include the grey colored Go-Away, with pigmented rather than irredescent feathers, and hornbills with breaks that assume a massive, almost ancient-looking aspect. White-crowned shrikes, blue-naped mousebirds, brilliantly colored superb starlings and Somali crows often travel in small flocks: the birds use social behavior and cooperation to find food and avoid predation in the challenging environment of the desert. An Acacia tortilis prepares to flower. 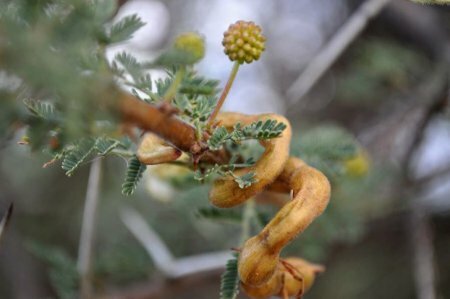 Above, an incipient Acacia flower rises from a twig also supporting its delicate, compound leaves, sharp thorns and a hanging seedpod. 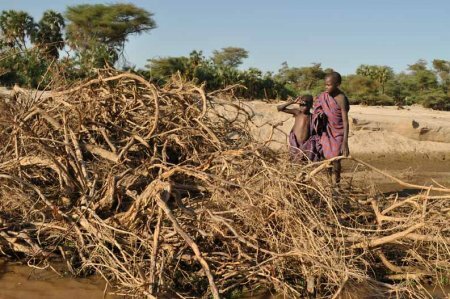 The pods are used by people to make flour, the flowers harvested by innumerable insects, and the leaves were once grazed upon by giraffes, now gone from Turkana. Luke Lomeiku holds a young fish. 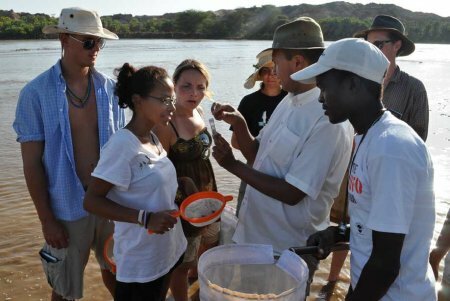 At the Turkwel River, students found a great many young animals recently hatched after the rains. Catfish splashed in shallow pools and fish fry darted beneath the muddy waters as students approached with sampling nets. Alisha, Meadow and Kasia walk alongside the Turkwel’s active channel. Two Turkana boys watch from a safe distance as TBI students become excited over finding a frog. Having left their goats to drink at the water’s edge, these two children came to watch TBI students collecting samples from the river. After waiting some distance away for a while, and playing a harmonica they shared, the two came to look at our collected specimens. Dino shows Peter, Kelly and Mandy a fish he’s found as Chelsea, Luke and Ben watch alongside. Dino places a frog in pure alcohol for preservation and subsequent study as students look on with amazement. 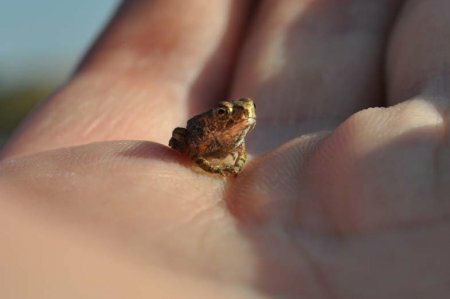 A small frog found in the mud. Frogs were so abundant by the late afternoon, they seemed to be growing from the mud flats themselves. Many animals take advantage of the rain to breed, including globeskimmer dragonflies, who as adults may migrate distances greater than 10,000 kilometers around the earth. 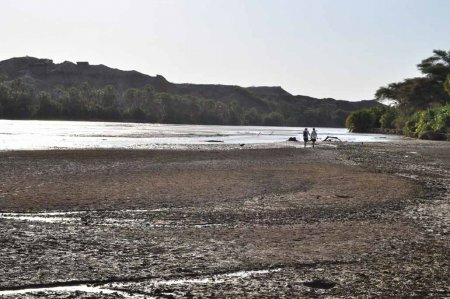 Sonia and Debbie walk along the shores of the Turkwel River. A camel watches warily as it feeds on Kadaba rotundifolia plants in the late afternoon. 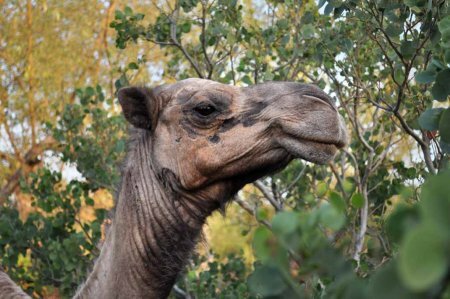 Camels are said by the Swahili to know the 100th name of Allah. By the looks on their faces, however, you can see that they’ll never tell. Grazing by camels and goats appears to be shifting the floral community alongside the Turkwel River. These plants, living in what is called the “riparian” zone, were once dominated by the wide, arching trunks of Cordia sinensis trees, their leaves draped like willows, and by Zisyphus or Lawsonia. Now, for reasons that are not wholly clear, Acacia and Kadaba appear to be replacing them. The moon rises shortly after sunset on the Turkwel. The moon recently reached its greatest brilliance, lighting the desert and steppe sands of Turkana as if they were snow. Above, 4 million year old sandstones and recent lakebed deposits are lit by the last light of the sinking sun, as the moon rises behind them. 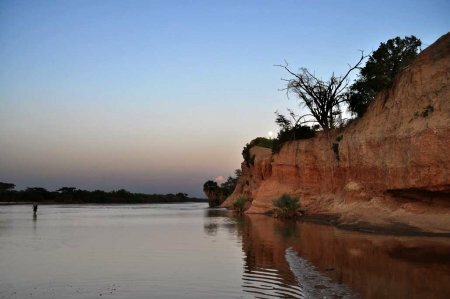 Turkana shepherds and TBI students make their last river crossings before nightfall. A scorpion illuminated by ultraviolet light. Scorpions are important insect predators in Turkana, and emerge from their burrows at night to forage within dead leaf litter and tree trunks. Those that have large pincers are frightening to look at, but harmless. Those with large tails, like those above, carry a poison that can be deadly. There are many species of scorpion in the desert, and most will glow when ultraviolet light is shone on them. 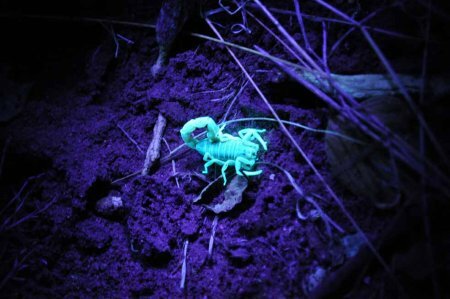 Scientists have recently argued that this glow is not a warning signal to other species, but rather a signal for the scorpions themselves, helping them return to their burrows before daybreak. Before heading to bed, Wyatt found a beautifully colored gecko. Students returned him to the tree from which he was found before turning in.